Lolot is a herbaceous perennial vine with creeping rhizomes, commonly known as Wild Betel. 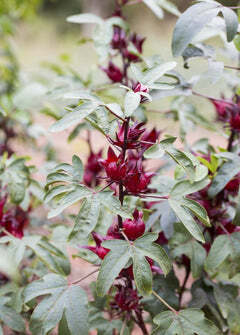 It is cultivated for it's dark green, glossy leaves which have both medicinal and culinary purposes. Lolot is most popularly used to wrap meat with in Southeast Asian cooking. The leaves are traditionally prepared fresh as a salad in Laotian and Malay cuisine. Medicinally, the whole plant possesses anti-inflammatory, expectorant and anodyne properties. Lolot has a beautiful tropical look and makes the perfect ground cover for an edible landscape. Lolot is related to another Sow Exotic favorite, Hoja Santa. Mature Size: About 2 ft tall with a large full 5-10 ft spread. Soil & Moisture: Lolot likes moist, well-drained soil. We plant ours under large shady oak trees.